1. Keep an open mind. You may have bracelets or rings that you don’t like to wear or were family heirlooms. The stones or charms on the jewelry could be used to make a necklace or earrings. Let your imagination run wild! You can give your jewelry a new life to someone who will appreciate it. It’s good to research the style and fashion of today, as well as what your jewelry could be worth as is. If you feel your jewelry might receive more attention after a redesign, then figure out what piece of jewelry your stones could be more eye-catching as. Find out today’s value of what you plan on redesigning it as, you might be surprised if your jewelry is worth more as is. There are many places that you can find inspiration to create new and unique pieces. Play around with the jewelry. For rings try it on different bands, or try a bracelet as a necklace. You can often find inspiration looking through magazines or even going on a walk. It always helps when you can get a second opinion on your new creation. Ask someone you trust to give an honest opinion and what you should change or not change. There might be an easy explanation as to why a piece does or does not work in your style. Try wearing it after you’ve redesigned it and see how it feels. This is a true test to see if the piece works or what you need to fix. Even replacing a clasp can make a difference. Using different beads or adding more stones to a piece can be enough to change your opinion of it. Make sure you look into the new value of your redesigned piece. Simple redesign changes can change the life of the jewelry. Gift giving and be hard…and expensive. So, why not gift jewelry that you are planning on selling? There are certain pieces of jewelry that might mean more to someone as a gift rather than selling it for a price lower than you expected. Silver chain-link Tiffany bracelets usually sell for a lower price than other Tiffany jewelry, because it is silver. By simply re-polishing the bracelet and gifting it to a friend that would appreciate it, you can give the bracelet a new life! 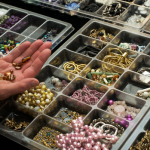 Redesigning old jewelry can also be an easy way to get a better value for your jewelry. By dipping a yellow-gold ring in white-gold, you can make the ring blend in with today’s fashion (making it a more versatile piece). A redesigned piece can also make a great gift for a friend or loved one. 1. The gift should be a good match. Do not regift just to regift. If you think the receiver won’t like the gift, then the receiver probably won’t either. Make sure that before you regift, that the receiver will appreciate and use it. If not, then don’t bother to regift it. 2. Make sure the gift is in good condition. You wouldn’t want to receive a damaged or broken gift, so don’t regift jewelry that is. Redesign it or pair it with another piece of matching jewelry or accessory. 3. Do not regift to the same social circle. You do not want to make it obvious that you’re regifting, especially if you’ve forgotten who gave it to you. You don’t want to accidentally give it back to its original owner, so regift to a different social group. 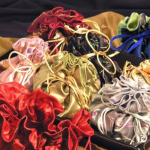 Be sure that when you do regift a piece of jewelry that you don’t wrap it in the same bag that was given to you as a gift. Take off old tags and put it in a new bag. If you are hesitant to regift, then you might feel guilty about it when you do. Take the time to turn your old jewelry into something new if you plan to regift it, and research the value of the jewelry you are still willing to sell. We have 31 reviews on Yelp, but wondered why we have 43 other filtered reviews? Yelp introduced a filter on the reviews shortly after their launch in 2005. It is meant to keep business ratings from being vandalized by suspicious reviews that could keep a business from achieving 5 stars. Yelp’s filter method could be helpful in some cases, but it may be hurting other businesses that depend on Yelp’s rating. 1. Look past the start rating. Depending on what reviews were filtered out of the star rating, the business could receive 1 star for 2 negative comments, while their filtered reviews have 15 five-star comments. It is always good to read the reviews, as well as the filtered reviews (in gray, at the bottom of the reviews). These can give you an idea of what the person may have been feeling that day or if the business really did have terrible customer service. 2. Is the reviewer legitimate? It is good to check on the reviewer’s profile if his or hers review looked fake. Also, notice the tone that the review is written in. If there are only negative reviews that he or she has left for businesses, then that person may be letting out frustration and anger through negative comments. On the other hand, if there are only positive reviews, that person may just be putting in a good word for friends. 3. Does the business respond to criticism? If there are bad reviews on a businesses’ Yelp page, check to see if the business owner responded to the disgruntled customer. These responses can give you a hint of how the business treats their customers (are they appreciative, helpful, or wanting to right the wrong?). Global Gold and Silver has excellent ratings from real customers. We make sure that our customers leave us with a good experience. Yelp has shown that stars can have a difference in the way a business is perceived. Research the reviews for yourself to decide if a business is worth visiting. Selling your silver coins can be difficult when there are so many types and aspects to consider. From various years and proof sets to U.S. mint coins and bullion coins, it’s important to find the right gold and silver buyer that is knowledgeable about silver coins. So what should you know about the types of coins that you can sell? When you’re considering the value of certain years of a coin, some are more valuable than others. For example, coins minted before 1965 are 90% silver while 1965-1969 with only 40% silver. This is important especially if a year is rarer and more valuable than others. If you have a proof set, made of proof coins (coins made using a high-quality minting process and made especially for collectors) from one particular year, certain sets can be more valuable than others. A 1936 U.S. Proof Set is worth thousands of dollars, which can be more or less than other years. Mint coins can vary in value as well, and offer a special symbol (mintmark) corresponding to the branch that the coin was minted at. Prior to 1909 (except 1838-39) the mintmark appeared on the reverse of the coin but coins minted 1968 and later, the mintmark appeared on the obverse side of the coin. A set of mint coins includes each denomination produced by one particular mint. A bullion coin is kept as a store of value or as an investment and varies in weight, metal (gold, silver, platinum, or palladium), and type. These coins have a purity that is greater than 0.900 and sell for a premium over the market price of the metal on the commodities exchanges. There are various years that produced coins at a heavier weight. The premium of the coin value is also affected by the demand for the coin. Each coin differs with each type, year, weight, and purity level and produces a unique value. It is best to look into the particular coin that you would like to sell and find a gold and silver buyer with the experience to handle the value of your coin. At Global Gold and Silver, our experts have years of experience and understand what your coin can mean to you. Whether you would like an appraisal online or in-person, our knowledgeable staff will help you to sell your silver coins at the price it deserves. This can be difficult if you’re selling a vintage piece, but you should do research on how much your item is currently selling for. This will help you gauge whether or not the offer you receive is accurate and fair when you do decide to sell your watch. Our expert watch buyers have the knowledge required to identify the watch, confirm its authenticity, and determine its fair market value. Before you run off to sell your watch, do some research on the watch itself. This is especially important if you’re selling a vintage or high-end piece. When was it manufactured? Is it a limited edition? Has it been serviced in the time you’ve owned the watch? These are all important questions to research before you try and sell your watch. The answers to these questions will affect the price of your watch. Getting your watch appraised is always a good idea. But it’s also best to get a second opinion so you know you’re getting a fair price. This will help guard against not receiving the full value for your watch. Global Gold and Silver has over 40 years experience in appraising, buying, and selling watches, and will always determine fair market value, but we always welcome customers finding a second opinion. We give each customer 10 days to accept or decline our offer. If your watch is made of precious materials, particularly gold, you could consider waiting a short amount of time to see if the price of gold goes up. If it does, you’ll end up getting a better price when you do sell your watch. Of course this also means that the price of gold could go down, so it’s a risk, but it could be worth it. When choosing a buyer, look at the recent payouts for items similar to yours. This will allow you to get an idea of how much your buyer is willing to pay for your item. At Global Gold and Silver, we offer this service for free online. It features a picture of our recent payouts, a short description, and the price. Once you’ve decided to sell your watch with Global Gold and Silver, you can either speak with a local watch buyer, or fill out our form for a fast appraisal. With free insured FedEx shipping with up to $25,000 insurance, you can be assured that not only are you getting the best deal when you sell your watch, but also the safest. [title] => When is the Right Time to Sell Gold? Gold prices fluctuate, and there are different aspects that contribute to its fluctuation. So, when is the right time to sell gold? Many people feel that they should wait to sell when the price of gold it at its highest. Waiting until gold is at its highest may not come in handy, especially if you need the money. Trying to sell $1,000 worth of gold and waiting only because you know there will be a 2 percent increase in the price, will not be beneficial to you when you need the money in a short amount of time. This 2 percent may only give you $20 more and in the time you waited the cost of living may have increased, and what you can buy for a dollar today may not stretch as far as it did today! When is the best time to sell gold? It’s when you need the money. Gold is in a stable position right now, and has been for a few years. This could change, and selling your gold should be on your time not gold’s time. 2. Gold prices increase when the value of the dollar decreases. Typically, this can be easy to tell, especially if the Federal Reserve is printing more money (indicating that the dollar’s value is decreasing). But since 2009, the economy has not been considered typical. 3. Gold prices increase during hard times. Gold has been considered a “safe haven” during these recent hard economic times. Investors have taken gold as a safe and stable investment when the economy has become unpredictable, and in doing so increasing the price of gold. Selling your gold depends on when you need the money. Gold prices can increase or decrease, but it may not make a difference unless you’re selling a larger amount of gold. At Global Gold and Silver, we can help you with the process of selling your gold and silver. Come in and let us help you to sell your gold. Gift giving and be hard…and expensive. So, why not gift jewelry that you are planning on selling? There are certain pieces of jewelry that might mean more to someone as a gift rather than selling it for a price lower than you expected. Silver chain-link Tiffany bracelets usually sell for a lower price than other Tiffany jewelry, because it is silver. By simply re-polishing the bracelet and gifting it to a friend that would appreciate it, you can give the bracelet a new life! We have 31 reviews on Yelp, but wondered why we have 43 other filtered reviews? Yelp introduced a filter on the reviews shortly after their launch in 2005. It is meant to keep business ratings from being vandalized by suspicious reviews that could keep a business from achieving 5 stars. Yelp’s filter method could be helpful in some cases, but it may be hurting other businesses that depend on Yelp’s rating. Selling your silver coins can be difficult when there are so many types and aspects to consider. From various years and proof sets to U.S. mint coins and bullion coins, it’s important to find the right gold and silver buyer that is knowledgeable about silver coins. So what should you know about the types of coins that you can sell? At Global Gold and Silver, most people sell gold, silver, and precious stones. But you can also sell watches! Global Gold and Silver accepts watches from brands like Rolex, Breightling, Cartier, along with luxury time pieces, gold and pocket watches. We have five tips to selling your watch for cash: Find out how much your item costs for the new fair market value This can be difficult if you’re selling a vintage piece, but you should do research on how much your item is currently selling for. This will help you gauge whether or not the offer you receive is accurate and fair when you do decide to sell your watch. Our expert watch buyers have the knowledge required to identify the watch, confirm its authenticity, and determine its fair market value. Gold prices fluctuate, and there are different aspects that contribute to its fluctuation. So, when is the right time to sell gold? Many people feel that they should wait to sell when the price of gold it at its highest. Waiting until gold is at its highest may not come in handy, especially if you need the money. Trying to sell $1,000 worth of gold and waiting only because you know there will be a 2 percent increase in the price, will not be beneficial to you when you need the money in a short amount of time. This 2 percent may only give you $20 more and in the time you waited the cost of living may have increased, and what you can buy for a dollar today may not stretch as far as it did today!